Bukharin, Nikolai, 1888-1938]; Vengerskaia Sektsiia po agitatsii i propagandy pri Gubkome R. K. P.
1920. TSIRK KOLLEKTIV. Krasnaia Maska. [Russia: Tipografiia Sporta, circa 1920]. Large poster (28 by 21 inches), tissue-backed. Handsomely matted and framed, entire piece measures 34 by 27 inches. 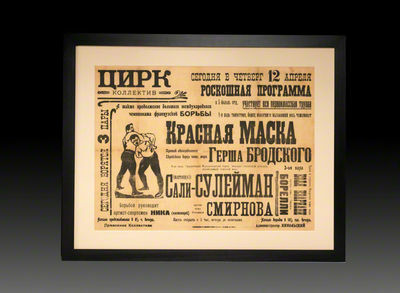 $2800.Large original poster announcing a program of competitive wrestling matches conducted under the auspices of the Â“Tsirk KollektivÂ” (Circus Collective), typeset in a wide selection of Cyrillic wooden fonts, with bold woodcut of a pair of wrestlers.The Â“stellar programÂ” described on this original sporting poster from the early years of the Soviet Union features three wrestling matches: the Â“Red Mask against Gersh Brodskii, the only Jewish wrestling champion in the world,Â” Â“Sali-Sulieman, the strongest Muslim wrestler, a fovorite of the Russian public, undefeated champion of the world, against the champion of the Volga region, Smirnov,Â” and finally the main event, Â“Kolya Kraviani vs. Borelli of Tiflis [Tiblisi].Â” Two faint fold lines, small paper repair to intersection. A striking piece. Frauen-Akt ( Rückansicht ). Ölgemälde auf Platte, signiert. Chelsea, UK, January 12, 1920. 4.5" x 5.75". "Single page ALS, signed in full signature ""A.A. Milne"" and dated ""12. 1. 20"" (January 12, 1920), 4.5"" x 5.75"" on stationary with letterhead of 11, Mallord Street, Chelsea, S.W.3. Tel Kensington 2074. Expected center fold. Very soft rippling to the page. Near fine.Before Christopher Robin and Milne's children series of adventures of Winnie The Pooh, Milne dabbled with an earlier novel he in part considered as a work for children, whoever one which could also be enjoyed by adults. In his letter to Vincent Seligman, who became a life long friend spanning his adult lifetime, Milne displays his typical jocular humor about his new children's novel, ""One on a Time"", published in 1917 by Hodder and Stoughton. He jovially pokes fun at himself when notes to Seligman, ""You seem to have had nearly all the copies of ""Once on a Time"" which were sold. This is my favorite book, and it is a shock to find that I only had two readers when I thought I had eight."" Milne heavily critiqued this book, and was known to have even said ""This is an odd book"" and indeed it is very difficult to classify. Ostensibly a typical fairytale, it tells the story of the war between the kingdoms of Euralia and Barodia and the political shenanigans which take place in Euralia in the king's absence, all supposedly rewritten by Milne from the writings of the fictional historian ""Roger Scurvilegs"".This letter marks the early beginnings of the making of one of the most famous children's authors of the 20th century! Milne created ""Once on a Time"" to contain believable, three-dimensional characters, rather than the stereotypes which will satisfy children. Hence the book introduces us to a princess who is far from helpless; a prince who, whilst handsome, is also pompous and vain; an enchantment which is almost entirely humorous; a villain who is not entirely villainous and receives no real comeuppance; a good king who isn't always good; an evil king who isn't always evil, and so on. The result is a book which children may not enjoy as much as adults. The book was written by Milne partly for his wife, upon whom the character of the Countess Belvane was partially based.He was known to grapple with the definition of a children's book, and philosophical about what exactly constitutes the definition of a children's book, including ""Once on a Time"". Milne was known to have said ""Is it a children's book? Well, what do we mean by that? Is The Wind In The Willows a children's book? Is Alice in Wonderland? Is Treasure Island? These are masterpieces which we read with pleasure as children, but with how much more pleasure when we are grown-up. In any case, what do we mean by ""children""? A boy of three, a girl of six, a boy of ten, a girl of fourteen - are they all to like the same thing? And is a book ""suitable for a boy of twelve"" any more likely to please a boy of twelve than a modern novel is likely to please a man of thirty-seven; even if the novel be described truly as ""suitable for a man of thirty-seven""? I confess that I cannot grapple with these difficult problems. But I am very sure of this: that no one can write a book which children will like, unless he write it for himself first. That being so, I shall say boldly that this is a story for grown-ups. [...] But, as you see, I am still finding it difficult to explain just what sort of book it is. Perhaps no explanation is necessary. Read in it what you like; read it to whomever you like; be of what age you like; it can only fall into one of the two classes. Either you will enjoy it, or you won't. 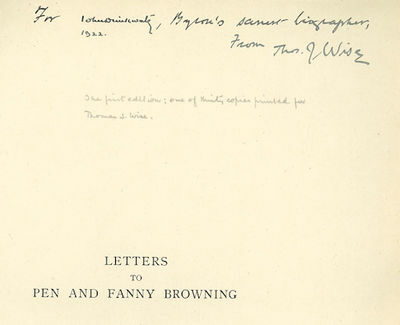 ""This delightful early letter, signed in full by A.A. Milne, is shown below. Little did he know at the time just how much he would come to dominate children's literature, with no worries about just how many copies were to be sold and read:""12 . 1 . 20Dear Mr. Seligman,I am afraid we cannot manage lunch on Thursday. My wife is a way at present, and probably comes back on that afternoon and I am engaged (illegible) thursday. After … if we may; or you must come and see us then and be introduced to the elephant outside the door.Re. Simpson. First … he is imaginary, though I know somebody like him (in manner, not in appearance). But curiously enough my wife and I were at the theatre on Thursday – though not in a box- and on the way out I was spoken to by a man whom I know slightly who is exactly like Simpson, this imaginary Simpson, in appearance. I feel that this must have been the man you saw. Otherwise the whole theatre seems to have been crowded with them.You seem to have had (illegible) the copies of ""Once on a Time"" which were sold. This is my favorite book, and it is a shock to find that I only had two readers when I thought I had eight. But I am very grateful to you for insisting on it.Yours sincerely,A.A. Milne"""
Art Deco, honden - Carl Josef Bauer, ca. 1920. VREUGDEVOLLE DAME MET HAAR HONDJEEts vervaardigd ca. 1920 door Carl-Josef Bauer. Met potlood genummerd 29/50 en gesigneerd.Bauer (1895 -1964) studeerde aan de Kunst-Akademie in M?nchen en stelde tentoon in o.a. de befaamde Glasplalast. Bauer was 10 jaar voorzitter van kunstenaarsvereniging Allotria. 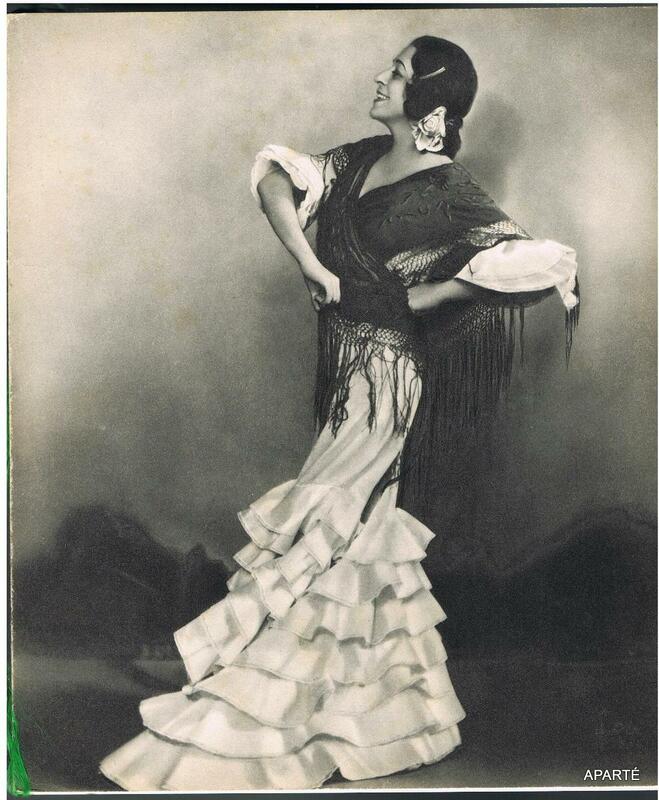 Het leeuwendeel van zijn etswerk kwam tot stand tussen 1914 en 1928.Bauer werd met name bekend om zijn naakten en afbeeldingen van beroemde filmsterren zoals Greta Garbo, Dolores del Rio en anderen in typische Art Deco stijl.Prijs: ?950,- (incl. 21% BTW, incl. lijst). 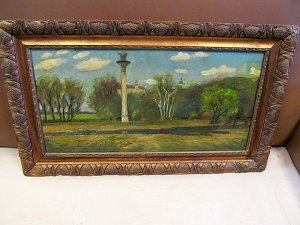 - Flammarion, Paris 1920, 13x19cm, relié. - Prima edizione, una delle 40 copie numerate sulla Cina, edizione deluxe. foxing inevitabile che colpisce principalmente i margini di alcune foglie. - [FRENCH VERSION FOLLOWS] Edition originale, un des 40 exemplaires numérotés sur Chine, tirage de tête. Inévitables rousseurs affectant principalement les marges de certains feuillets. 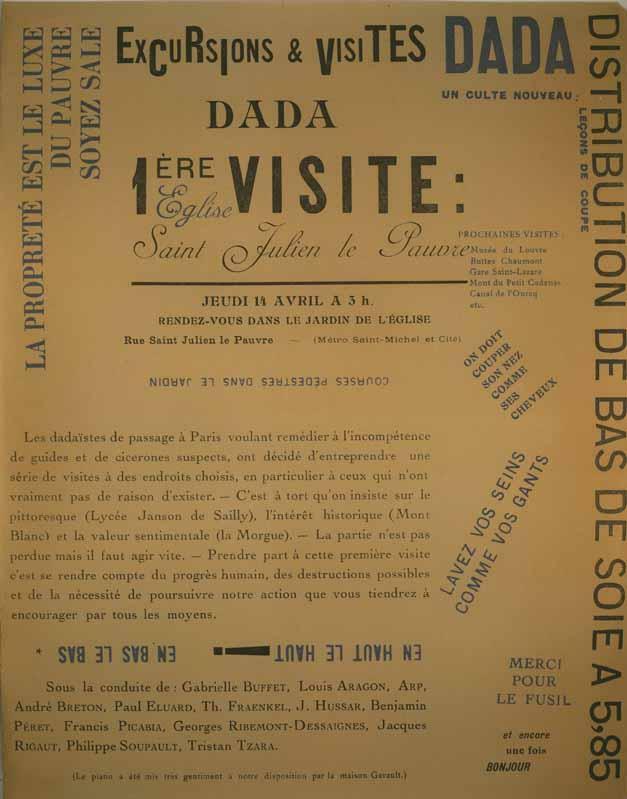 Excursions & visites dada. 1ère visite: Eglise Saint-Julien le Pauvre. Jeudi 14 avril a 3 h. Rendez-vous dans le jardin de l'eglise. Tapiau 1858 - 1925 Zandvoorst) Die Opferung Isaacs (nach Rembrandt). Radierung von 1920. Unten rechts signiert. 31,5 x 25 cm (Blattgröße 46,5 x 30 cm). Unter Passepartout schön gerahmt. The Storm of Steel. From the Diary of a German Storm-Troop Officer on the Western Front. - [Emotionally inscribed by Chapman, who voices his disgust at Ernst Juenger's account of World War One. / Comes with Storm of Steel, Folio Society edition, London, 2012]. Chelsea, UK: , January 12, 1920. Chelsea, UK, January 12, 1920. 4.5" x 5.75". "Single page ALS, signed in full signature ""A.A. Milne"" and dated ""12. 1. 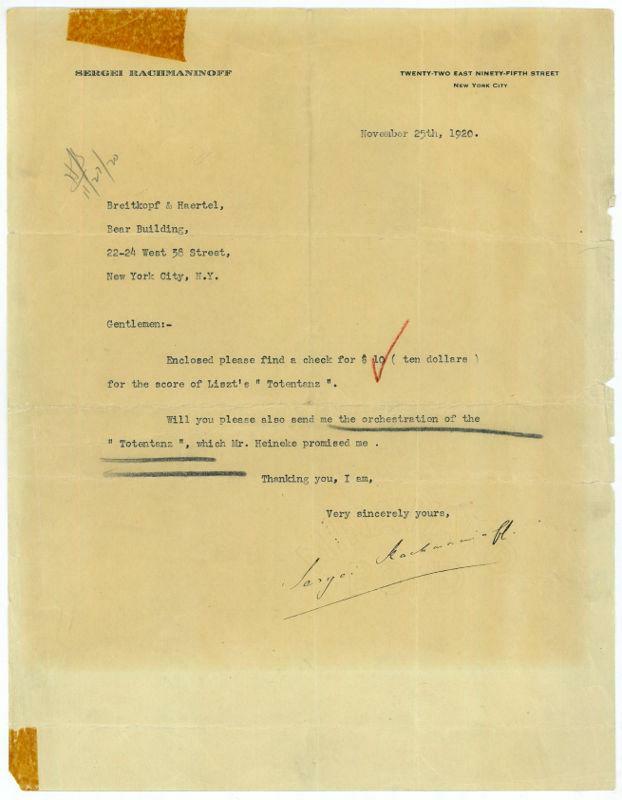 20"" (January 12, 1920), 4.5"" x 5.75"" on stationary with letterhead of 11, Mallord Street, Chelsea, S.W.3. Tel Kensington 2074. Expected center fold. Very soft rippling to the page. Near fine.Before Christopher Robin and Milne's children series of adventures of Winnie The Pooh, Milne dabbled with an earlier novel he in part considered as a work for children, whoever one which could also be enjoyed by adults. In his letter to Vincent Seligman, who became a life long friend spanning his adult lifetime, Milne displays his typical jocular humor about his new children's novel, ""One on a Time"", published in 1917 by Hodder and Stoughton. He jovially pokes fun at himself when notes to Seligman, ""You seem to have had nearly all the copies of ""Once on a Time"" which were sold. This is my favorite book, and it is a shock to find that I only had two readers when I thought I had eight."" Milne heavily critiqued this book, and was known to have even said ""This is an odd book"" and indeed it is very difficult to classify. Ostensibly a typical fairytale, it tells the story of the war between the kingdoms of Euralia and Barodia and the political shenanigans which take place in Euralia in the king's absence, all supposedly rewritten by Milne from the writings of the fictional historian ""Roger Scurvilegs"".This letter marks the early beginnings of the making of one of the most famous children's authors of the 20th century! Milne created ""Once on a Time"" to contain believable, three-dimensional characters, rather than the stereotypes which will satisfy children. Hence the book introduces us to a princess who is far from helpless; a prince who, whilst handsome, is also pompous and vain; an enchantment which is almost entirely humorous; a villain who is not entirely villainous and receives no real comeuppance; a good king who isn't always good; an evil king who isn't always evil, and so on. The result is a book which children may not enjoy as much as adults. The book was written by Milne partly for his wife, upon whom the character of the Countess Belvane was partially based.He was known to grapple with the definition of a children's book, and philosophical about what exactly constitutes the definition of a children's book, including ""Once on a Time"". Milne was known to have said ""Is it a children's book? Well, what do we mean by that? Is The Wind In The Willows a children's book? Is Alice in Wonderland? Is Treasure Island? These are masterpieces which we read with pleasure as children, but with how much more pleasure when we are grown-up. In any case, what do we mean by ""children""? A boy of three, a girl of six, a boy of ten, a girl of fourteen - are they all to like the same thing? And is a book ""suitable for a boy of twelve"" any more likely to please a boy of twelve than a modern novel is likely to please a man of thirty-seven; even if the novel be described truly as ""suitable for a man of thirty-seven""? I confess that I cannot grapple with these difficult problems. But I am very sure of this: that no one can write a book which children will like, unless he write it for himself first. That being so, I shall say boldly that this is a story for grown-ups. [...] But, as you see, I am still finding it difficult to explain just what sort of book it is. Perhaps no explanation is necessary. Read in it what you like; read it to whomever you like; be of what age you like; it can only fall into one of the two classes. Either you will enjoy it, or you won't. 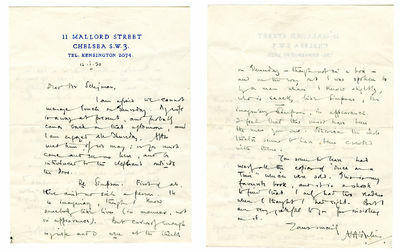 ""This delightful early letter, signed in full by A.A. Milne, is shown below. Little did he know at the time just how much he would come to dominate children's literature, with no worries about just how many copies were to be sold and read:""12 . 1 . 20Dear Mr. Seligman,I am afraid we cannot manage lunch on Thursday. My wife is a way at present, and probably comes back on that afternoon and I am engaged (illegible) thursday. After â€¦ if we may; or you must come and see us then and be introduced to the elephant outside the door.Re. Simpson. First â€¦ he is imaginary, though I know somebody like him (in manner, not in appearance). But curiously enough my wife and I were at the theatre on Thursday â€“ though not in a box- and on the way out I was spoken to by a man whom I know slightly who is exactly like Simpson, this imaginary Simpson, in appearance. I feel that this must have been the man you saw. Otherwise the whole theatre seems to have been crowded with them.You seem to have had (illegible) the copies of ""Once on a Time"" which were sold. This is my favorite book, and it is a shock to find that I only had two readers when I thought I had eight. But I am very grateful to you for insisting on it.Yours sincerely,A.A. Milne"""
London: Printed for Private Circulation only by Richard Clay and Sons, Ltd., 1920. 15,pp. Sewn printed wrappers. Fine, in folding cloth case, with poet John Drinkwater's gilt morocco bookplate inside the case. First edition. One of 30 copies printed for private distribution by Thomas J. Wise. With the 1922 dated ownership signature of poet/biographer John Drinkwater, surrounding which Wise has inscribed "For [John Drinkwater 1922], Byron's sanest biographer From Thos. J. Wise." Drinkwater's biography of Byron, THE PILGRIM OF ETERNITY, was first published in 1925. Drinkwater contributed an Introduction to the fourth volume (1923) of THE ASHLEY LIBRARY: A CATALOGUE ..., and it has been noted that, "Viewed with hindsight, some of the prefaces read rather oddly, none more so than John Drinkwater's..." - John Collins, THE TWO FORGERS..., p.217. TODD 99d. VAN DYKE Henry FAIRBANKS Douglas, Jr.
1920. VAN DYKE, Henry. The Works of Henry Van Dyke. New York: Charles ScribnerÂ’s Sons, 1920-27. Eighteen volumes. Octavo, contemporary three-quarter brown morocco gilt, elaborately gilt-decorated spines, raised bands, top edges gilt, uncut. 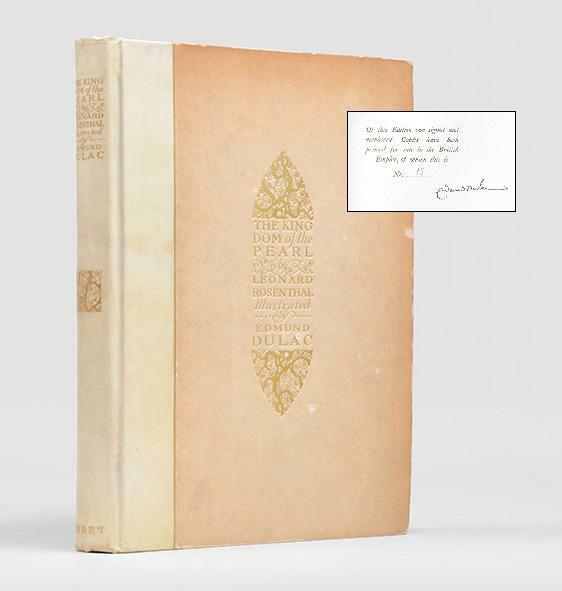 $4000.Â“AutographÂ” edition, number 324 of 504 sets, signed by Van Dyke on the frontispiece portrait in Volume I. Douglas Fairbanks, Jr.Â’s copy, with his bookplates.Poet, naturalist, minister, and diplomat, Van Dyke was one of the great polymaths of early 20th-century America. His work here includes poetry, Studies in Tennyson (the best critical appraisal of the poet at the time, according to Tennyson himself), and much of his writing on angling and nature. With bookplates of actor Douglas Fairbanks, Jr. Compared to his swashbuckling father, Douglas Jr. was Â“more voguishly handsome than his fatherÂ” (Thomson, 281); he was awarded the United States NavyÂ’s Legion of Merit, the Italian War Cross, the French LegiondÂ’honneur and the Croix de guerre, and the British Distinguished Service cross for his service in World War II.Fine condition. Indien. Handbuch für Reisende. Mit dem Vortitel: Ceylon. Vorderindien. Birma. Die Malayische Halbinsel. Siam. Java. - Vordergelenk ca. 3 cm aufgeplatzt, die große Faltkarte (verso) alt hinterlegt, Klammerheftung angerostet, S. 105/106 ohne Textverlust leicht beschädigt, Alters- und Gebrauchsspuren gutes Exemplar., Exemplar aus der zweiten Bindequote von 1920, erkenntlich an den Verlagsanzeigen auf dem Vorsatzblatt, welche die im Jahr 1920 erschienenen bzw. geplanten Reisehandbücher nennen. Gedruckt bei Breitkopf & Härtel in Leipzig, 1914. Vollständig mit allen Karten, Plänen und Grundrissen, die große Faltkarte in der Kartentasche im hint. Deckel. - Vgl. Hinrichsen D 499. 1920. First Edition . (ARCHITECTURE) (PARIS) CONTET, F., et al. Les Vieux Hotels de Paris. 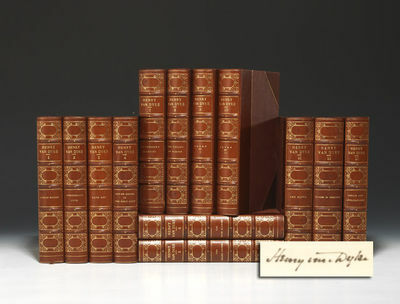 Fourteen volumes (of 22). WITH: DELABARRE, Edouard et BOULANGER, Marcel. Les Vieux Hotels de Rouen des XVII et XVIII Siècles. WITH: CONTET, F. Documents de Ferronnerie Ancienne. Paris: F. Contet, 1920-37; 1909; 1939. Together, 16 volumes. Folio, contents loose as issued in original publisherÂ’s cloth-backed marbled portfolios with cloth ties. $2800.Early collection of this elaborate photographic survey of the grand old hotels of Paris, with 640 lovely folio plates of photo-engraved views of exteriors, interiors and architectural details. With a similar volume dedicated to the 17th and 18th-century hotels of Rouen, and another devoted to ancient ironwork found in French buildings for a total of 716 folio plates.Each volume with at least 40, and as many as 70, full-page photo-engraved plates, along with essays by leading specialists on the historical and architectural background of the featured buildings, which include reproductions of contemporary engraved views and plans. Each series is sequentially intact beginning with the first volume, and no plates are missing from those volumes present. Hotels features exterior and interior views of the great hotels of Paris, district by district. Volume 1, 5th ed. ; Volumes 2-5, 4th ed. ; Volumes 6-7, 3rd ed. ; Volumes 8-10, 2nd ed. ; the balance of the set 1st ed. First 20 volumes of 22 published; first edition of Volume I issued 1908. Chateaux displays the interiors and exteriors of grand estates from L'ile-de-France (Volumes 1-8) and La Touraine (Volumes 9-11). 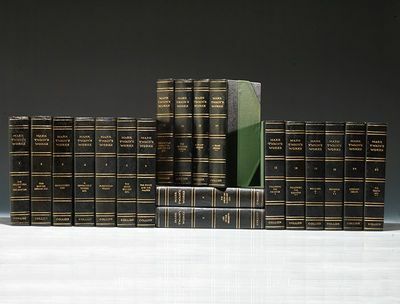 First 11 volumes of at least 14 published; first edition of Volume I issued 1913. Ferronnerie includes examples of decorative wrought iron as used in buildings from Amiens, Bordeaux, Chartres, Paris, Rouen, Toulouse &amp; Versailles, including fine staircases, balconies, grilles, knockers and locks. First four volumes of seven published; first edition of Volume I issued 1908. Normandie comprises views of civil architecture of the region from medieval times through the 18th century, from picturesque huts with thatched roofs to crowded town streets to mansions and castles. 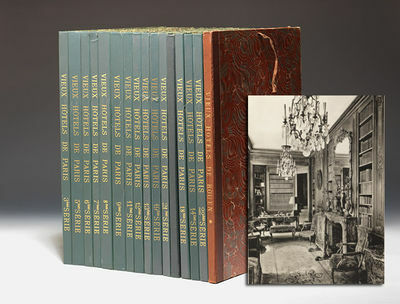 All five volumes published in the series, with publisherÂ’s prospectus for the series laid in Volume I. Vieux Hotels de Paris with 14 volumes of 22; not present: Volumes, 1, 2, 4, 10, 15, 16, 17, 20. No plates are missing from those volumes present. Text in French. Plates clean, text fine, original portfolios in with all original cloth ties and far nicer than typically found. About-fine condition. 1920. First Edition . Signed. MATISSE, Henri. Cinquante Dessins. Paris: Les Soins de l'Artiste, 1920. 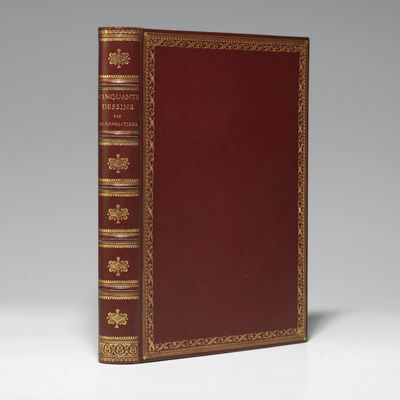 Quarto, period-style full dark red morocco, elaborately gilt decorated spine and boards, raised bands, marbled endpapers, each leaf mounted onto linen hinge, original printed paper wrappers bound in. 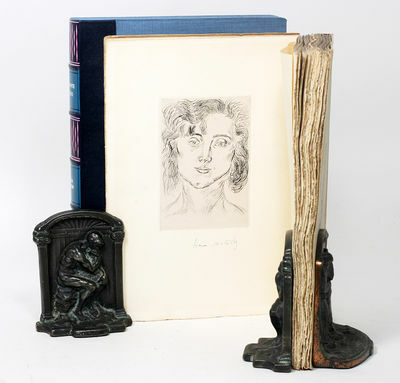 $13,500.First edition, number 236 of only 1000 copies with a lovely original etching by Matisse of a womanÂ’s face, entitled Â“Mlle. M. M,Â” signed by him. Presentation copy from Matisse's youngest son, Pierre, and his first wife Alexina ""Teeny"" Sattler, inscribed on a front flyleaf, ""For Dr. Bartlett from Pierre and Teeny Matisse."" Beautifully bound.Matisse himself edited and printed this lovely suite of 50 photo-lithographic reproductions of his drawings of women to accompany a 1920 exhibition of his work. ""Daily painting sessions alternated with hours on end devoted to drawing, a corrective Matisse would use from now on whenever he felt his work was in danger of losing its balance between color and feeling on the one hand, and line and form on the otherÂ… He returned over and over again to a lace collar, drawing it first in minute detail until he had got it by heart and could translated it at will with two swift lines 'into an ornament, an arabesque, without losing the character of lace, and of that particular lace'Â… Matisse was evolving methods he would use for the rest of his life. He published fifty of these drawings in a portfolio called Cinquante Dessins to coincide with his exhibition at Bernheim-Jeune in 1920. A surge of renewed energy pulses between the lines of the letters he wrote home as he drew them"" (Spurling, Matisse the Master, 225-26). Matisse's youngest son Pierre, who has inscribed and presented this copy, was born in 1900. He exhibited an early interest in the art market, and as a young man took a job at the Galerie Barbazanges-Hodebert in Paris. In 1924, he came to New York, where he began a distinguished career of 65 years as an art dealer. He married Alexina ""Teeny"" Sattler in 1929; they separated in 1949. Preface by Charles Vildrac. Text in French. Duthuit 68. Ink gift inscription.A fine signed copy, scarce and desirable. Ölgemälde mit zentraler Säule ( wohl eine Sieges- oder Friedenssäule mit Engel ) vor einem Teich. Im Hintergrund Baumgruppen und Gebäude. 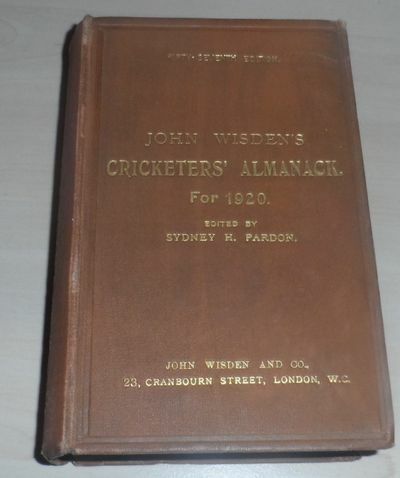 John Wisden's Cricketers' Almanack for 1920 - 1920 Original Hardback Wisden, Very Rare. 1920. This lot is an 1920 Original Hardback Wisden. In Good to Very Good Condition, I find this a hard year to find. This book is very nice, it has had some restoration to the spine gilt and the hinges but it has done the book well, the front baord is very nice with shiny, original gilt, light wear, the spine cloth is clean with new gilt. Internally the hinges are restored and strong, the pastedowns are the usual darker yellow , part of the front right is a bit darker than the rest but internally a wonderful book, with clean white pages, tightly bound and an excellent photoplate. Mystische Geschichten. Mit zwölf Steinzeichnungen und acht (tatsächlich 9) Strichätzungen von Alfred Kubin. 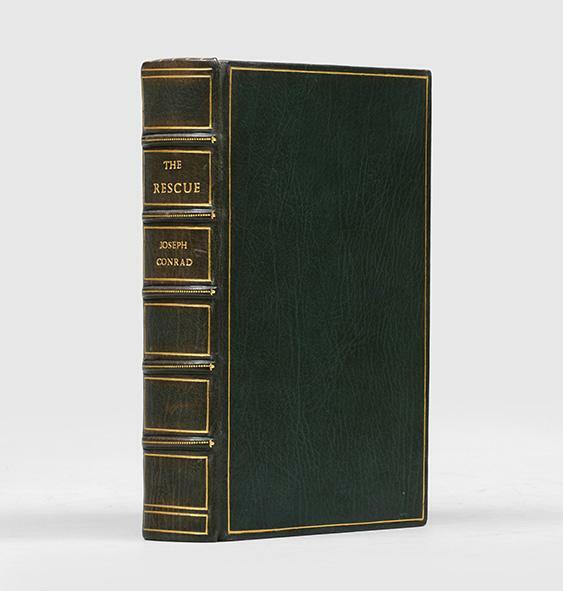 London: Nisbet & Co. Ltd.,  - Quarto. Original quarter vellum and white boards, titles to spine and cover gilt, patterned endpapers, top edge gilt, others untrimmed. With a maroon cloth solander case. Boards tanned, rubbing to corners and fore edge, light surface marks to rear board. A very good copy. Colour frontispiece and 9 tipped-in plates by Edmund Dulac, printed tissue-guards. English signed limited edition (first published with Dulac illustrations in French as Au Royaume de la Perle, 1920), number 15 of 100 copies signed by the artist, out of a total edition of 775 copies for sale in the British Empire (an additional 775 copies were published for the USA by Brentano's, New York, 1925). Rosenthal was a famed Parisian jeweller who personally commissioned Dulac's illustrations. 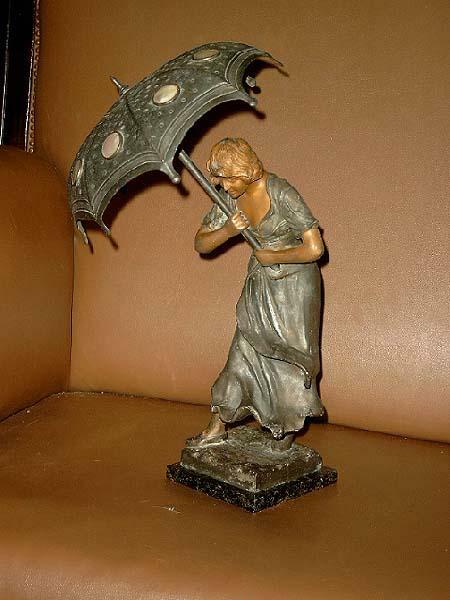 Berlin: Springer, 1920. 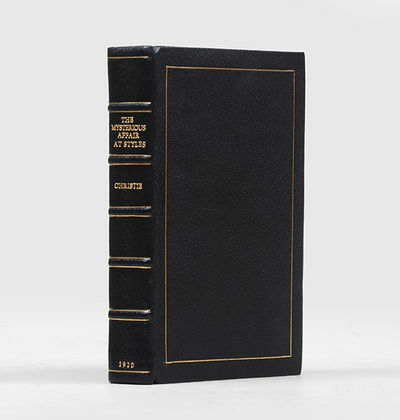 First edition, in the original printed wrappers, of the first description of what later became known as Creutzfeldt-Jakob disease, or CJD, following its independent identification by Alfons Jakob one year later. "Hans Gerhard Creutzfeldt and Alfons Jakob independently authored clinical and pathologic descriptions of a new syndrome in the 1920s. This syndrome, which subsequently came to be named after them, was characterized by dementia, motor and coordination abnormalities, a fatal course, and pathologic findings of diffuse spongiform neuronal degeneration. Although it appeared for many years to be little more than a medical curiosity, Creutzfeldt-Jakob disease attained widespread attention by its pathologic similarity to kuru and bovine spongiform encephalopathy, 'mad cow disease.' Because there are sporadic, familial, and iatrogenic forms of Creutzfeldt-Jakob disease, it is considered to have both genetic and infectious aspects. Although its causation has for some time been ascribed to 'slow viruses,' the etiology of Creutzfeldt-Jakob disease is currently thought to be due to prions, small proteinaceous infectious particles that have genetic encoding. The debate regarding whether the appearance of atypical Creutzfeldt-Jakob disease can be linked to the epidemic of 'mad cow disease' is currently unresolved" (Sternbach et al, p. 701). "While working at Alzheimer's neuropsychiatric clinic, 'Creutzfeldt studied the case of a 22-year old woman suffering from tremors, spasticity, and pyramidal signs. She became ataxic and demented. Her later symptoms included nystagmus, rigidity, myoclonus, and mutism; she ultimately died in status epilepticus 12 months after the onset. At Autopsy, Creutzfeldt found moderate cerebral atrophy with a patchy diffuse neuronal loss, pronounced astroglial hypertrophy, and bilateral degeneration of the corticospinal tracts. Creutzfeldt did not mention either neuronal vacuolation or a spongy state. Because of the war, publication was delayed until 1920. In 1921, Alfons Jakob (1884-1931) described three cases of 'spastic pseudosclerosis, disseminated encephalomyelopathy', and subsequently reported two other cases ['Über eigenartige Erkrankungen des Zentralnervensystems mit bemerkenswerten anatomischen Befunden,' Zeitschrift für die gesamte Neurologie und Psychiatrie 64, 147-228]. Jakob had examined Creutzfeldt's slides, and noting similarities among some of their cases, grouped them together as examples of 'spastic pseudosclerosis', a term Creutzfeldt disagreed with, believing their cases constituted a new clinical entity" (Encyclopedia of the Neurological Sciences, Vol. 1, p. 898). Creutzfeldt's material was lost during World War II. "Hans-Gerhard Creutzfeldt (1885-1964) was born in Harburg, Germany, and studied medicine in Jena, Rostock, and Kiel, where he received his MD in 1908. He wrote his thesis on tumors of the pituitary gland. From 1910 to 1912, he worked as a ship's doctor and then studied neuropathology with Ludwig Edinger in 1912. He spent 2 years with Alois Alzheimer in Breslau (present Wroclaw, Poland). After World War I, he worked with Walther Spielmeyer in Munich and with Ernst Siemerling in Kiel. For the next 14 years, he worked in the Department of Psychiatry of the Charité Hospital in Berlin with Karl Bonhoeffer. He returned to Kiel in 1938, was appointed director of Neuropsychiatry at the Christian-Albrechts University, and served there until 1953. He was one of the few academics who refused to join the Nazi party. He became the first postwar Rector of the University (1945-46). He ended his academic career at the Psychiatric Institute of Munich in 1955. He died after a long illness in 1964" (ibid.). Garrison-Morton 4719.1. Sternbach, Dibble & Varon, 'From Creutzfeldt-Jakob disease to the mad cow epidemic,' Journal of Emergency Medicine 15 (1997), 701-5. Rachmaninoff, Sergei, Russian pianist and composer (1873-1943). Apparently New York, 25. XI. 1920. - 4to. ¾ page. To the music publishing house Breitkopf & Haertel: "Enclosed please find a check for $10 (ten dollars) for the score of Liszt's 'Totentanz'. Will you please also send me the orchestration of the 'Totentanz', which Mr. Heineke promised me [.]". - On headed paper; some damage to edges and traces of sellotape. Old Nursery Rhymes. No. 1 Grannie's Little Rhyme Book. No. 2. Mother's Little Rhyme Book. No. 3. Auntie's Little Rhytme Book. No. 4. Nursie's Little Rhyme Book. No. 5.Daddy's Little Rhyme Book. No. 6. Baby's Little Rhyme Book. 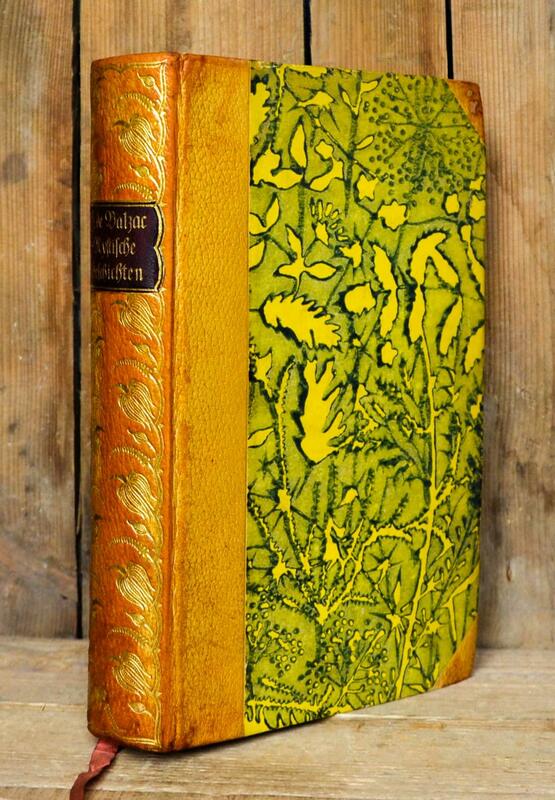 Each illustrated in colour; bound in patterned boards, with original pictorial dust-wrappers. Two with tears to the dust-wrappers; else an excellent set. Garden City: Doubleday, Page & Co., 1920. Large octavo. Full medium brown crushed levant, raised bands, gilt extra, gilt doublures and silk moiré endsheets, a.e.g. 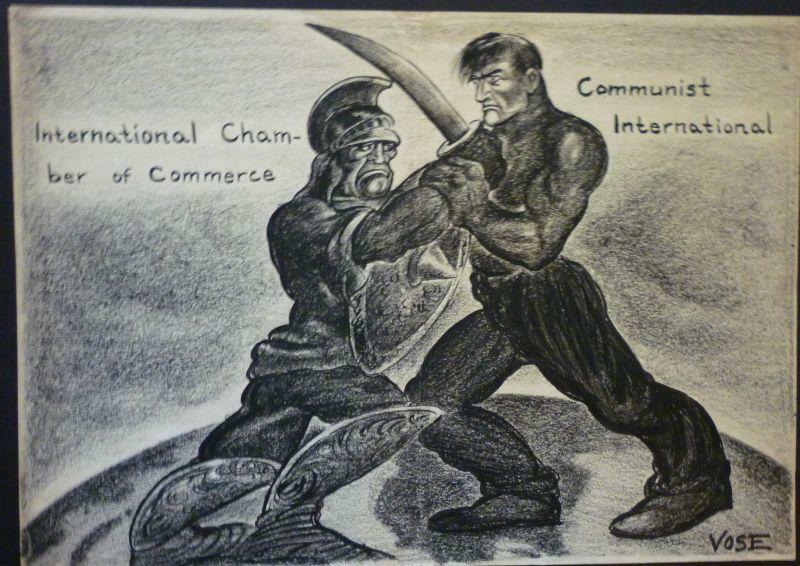 (unsigned but perhaps by Bennett). Illustrated with photographs by Lewis R. Freeman. A fine copy. First separate illustrated edition. 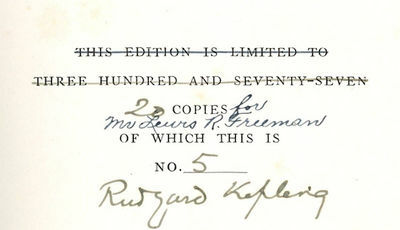 Copy #5 of twenty copies with the limitation statement amended by Kipling, and signed by him, with the denotation in another hand reserving these copies "for Mr. Lewis Freeman," the photographer. The ordinary edition consisted of 377 signed copies. The publisher retained the twenty copies for distribution to different parties according to Freeman's wishes. Freeman enjoyed a distinguished career as explorer, journalist and war correspondent, and his photographs accompanying Kipling's poems cover a wide range of his travels and interests. From the Nelson Doubleday collection sale. RICHARDS A329n. STEWART 291. 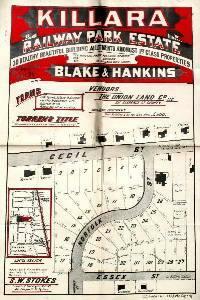 W.C. Penfold & Co., Sydney - Late 1920's land subdivision poster advertising "30 healthy beautiful building allotments amongst 1st class properties" between Cecil St and Essex St. Includes an inset map that shows the area where the lots are being sold in the context of local landmarks. 51 x 76 cms. Red and black printed sales poster on cream paper, title at top with the map below. 2" closed tear repaired above "Park", little dusty along one fold. 1920. TWAIN, Mark. Works. New York: P.F. Collier &amp; Son, circa 1920. Twenty-five volumes. Octavo, contemporary three-quarter black morocco gilt, top edges gilt. $4800.Handsomely bound set of the writings of Mark Twain..Â“High and fine literature is wine,Â” Twain once wrote, Â“and mine is only water; but everybody likes water.Â” This handsome edition of TwainÂ’s complete novels, essays and sketches attests to the enduring popularity and power of his worksÂ— many of which, despite their authorÂ’s protestation to the contrary, have come to be regarded as among the finest vintage American literature offers. Among other classics, this set includes A Connecticut Yankee in King ArthurÂ’s Court, Life on the Mississippi, and the incomparable adventures of both Tom Sawyer and Huckleberry Finn. Â“To understand America, read Mark TwainÂ” (Garry Wills). See BAL 3456. A few printing and paper flaws to about ten leaves in The American Claimant; a few repairs to morocco bindings. A handsome set. 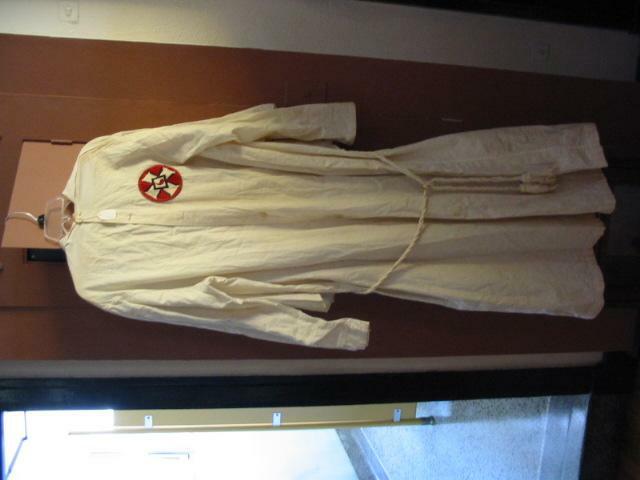 Original, Authentic Ku Klux Klan Robe with Baldric Shoulder Sash. np nd (c s) 1920 - Minor staining and wear else a decent condition robe with usual tilted St. Andrew's Cross (with blood drops at center) with original hood (marked "HBH" inside), original crimson satin shoulder sash (baldric) with green- leafed white camellia symbol stitched on plus 2" gold tassels at bottom. Worn by the "Order of Knights Kamellia" or "K-Duo Klansman." Fascinating and scary piece of Americana. um 1920 - Holzschnitt, ca. 1920, signiert, betitelt und mit &#132;Handdruck" bezeichnet. Darstellungsgröße 24,5:19,4 cm, Blattgröße 36,8:27,5 cm. Vollrandiger Abdruck auf bräunlichem Bütten. Paris: The Author Matisse, 1920. 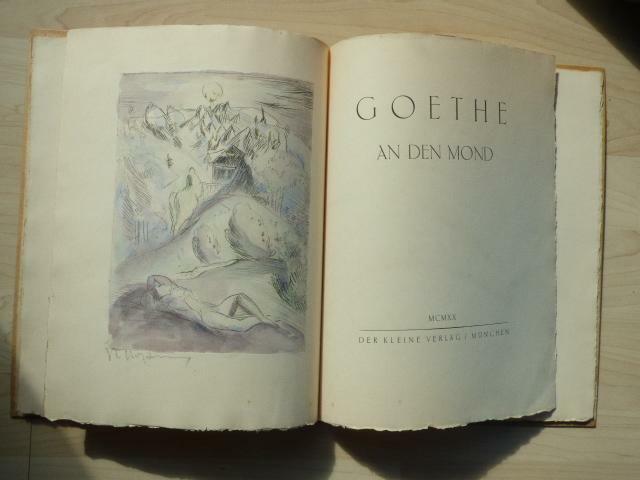 FIRST EDITION, WITH SIGNED MATISSE ETCHING. MAX WEBER'S COPY. AN OUTSTANDING ASSOCIATION COPY: Max Weber's copy, with his ownership signature on the front free endpaper.Max Weber, the great Russian-American Cubist painter, studied under Matisse in Paris. Matisse "interested him especially. So much so that... he helped to form with the Bavarian Hans Purrmann a small class to study under Matisse." Matisse's teaching and work would heavily influence the young Weber: "No American prior to 1913 had so effectively absorbed the insights of Picasso and Matisse." (Max Weber, Retrospective Exhibition; Scott and Rutkoff, New York Modern. )Additionally signed on the limitation page by Matisse's son, the art dealer Pierre Matisse. With 50 full-page plates of Matisse's drawings of women, in addition to the frontispiece etching of Matisse's daughter ("Mlle. 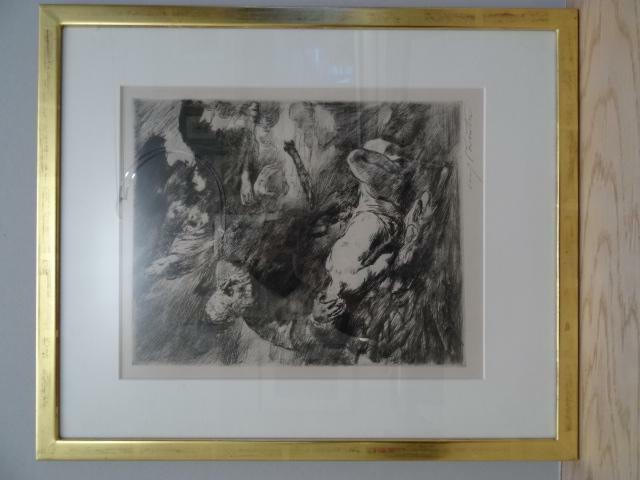 M.M") on chine collé and signed in ink by Matisse below the image. Produced to coincide with Matisse's exhibition of the drawings at Bernheim-Jeune in 1920. One of 1000 copies issued, although in most extant copies the frontispiece has now been removed.With preface by Charles Vildrac. Paris: (The Author), 1920. Quarto, original wrappers; custom box. Spine perished and reinforced at an early time. General wear to wrappers. Text block split and loose. Plates exceptionally clean. Note: Without the rare dust jacket issued in some copies in Pierre Matisse's possession.Housed in stunning custom box by celebrated book artist Sjoerd Hofstra. A beautiful book with an important association. Very Good. New York and London; John Lane Company [and] John Lane Company,, 1920. A Detective Story. Octavo. Recent dark blue morocco, titles and decoration to spine gilt, raised bands, single rule to boards gilt, blue endpapers. An excellent copy. First edition, first printing of Agatha Christie's first book, rare. 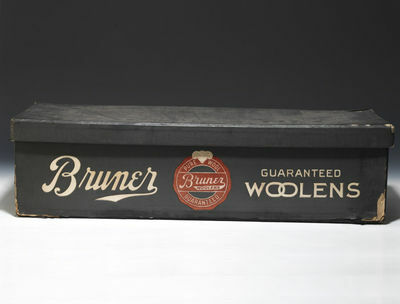 In 1922 the four corporations conveyed their property, including trade-marks, to a new corporation organized under the name Detmer, Bruner &amp; Mason. This company did not manufacture, but purchased woolens and trimmings in the market and sold them to retail merchants by the same means and in the same manner as the predecessor corporations had done (Wawak Co. vs. Kaiser). Case moderately worn, cloth hinges holding, damage to only one or two swatches. A scarce example of marketing in the textile industry, in extremely good condition. Paris: The Author Matisse, 1920. First. Very Good. FIRST EDITION, WITH SIGNED MATISSE ETCHING. MAX WEBER'S COPY. AN OUTSTANDING ASSOCIATION COPY: Max Weber's copy, with his ownership signature on the front free endpaper. Max Weber, the great Russian-American Cubist painter, studied under Matisse in Paris. Matisse "interested him especially. So much so that&hellip; he helped to form with the Bavarian Hans Purrmann a small class to study under Matisse." Matisse's teaching and work would heavily influence the young Weber: "No American prior to 1913 had so effectively absorbed the insights of Picasso and Matisse." (Max Weber, Retrospective Exhibition; Scott and Rutkoff, New York Modern.) Additionally signed on the limitation page by Matisse's son, the art dealer Pierre Matisse. With 50 full-page plates of Matisse's drawings of women, in addition to the frontispiece etching of Matisse's daughter ("Mlle. M.M") on chine collé and signed in ink by Matisse below the image. Produced to coincide with Matisse's exhibition of the drawings at Bernheim-Jeune in 1920. One of 1000 copies issued, although in most extant copies the frontispiece has now been removed. With preface by Charles Vildrac. Paris: (The Author), 1920. Quarto, original wrappers; custom box. Spine perished and reinforced at an early time. General wear to wrappers. Text block split and loose. Plates exceptionally clean. 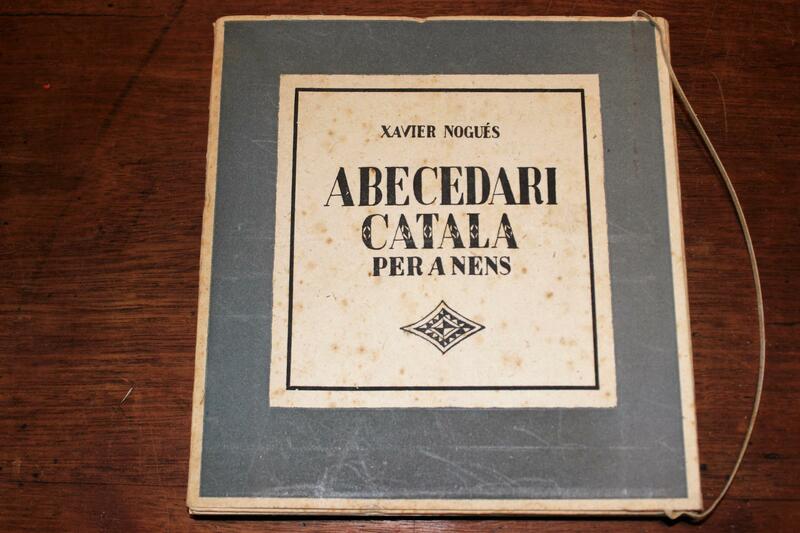 Note: Without the rare dust jacket issued in some copies in Pierre Matisse's possession. Housed in stunning custom box by celebrated book artist Sjoerd Hofstra. A beautiful book with an important association. Les Champs magnétiques. Paris. Au Sans Pareil 1920. 19,5 x 14,5 cm. 120 Seiten. Originalbroschur. Au Sans Pareil, 1920. Originalausgabe. 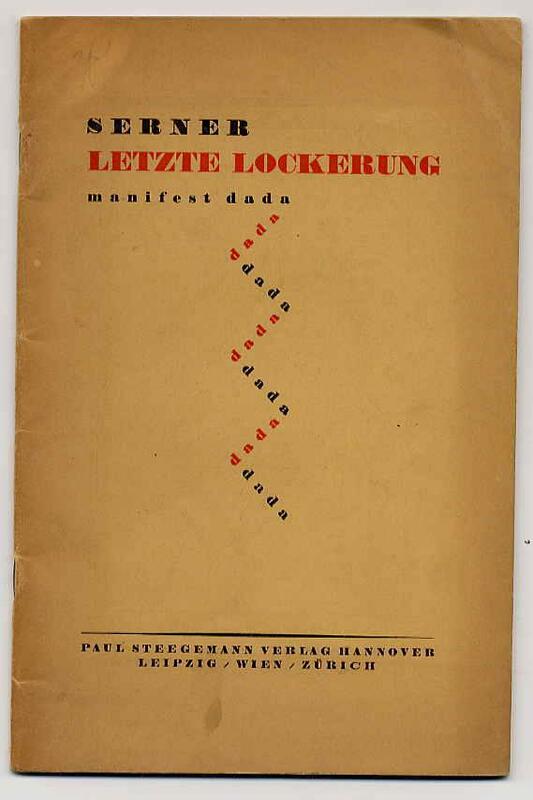 Centre Pompidou, Dada 1221 mit Abbildungen auf Seite 200 und 701 (gezeigt wurde lediglich die 2. 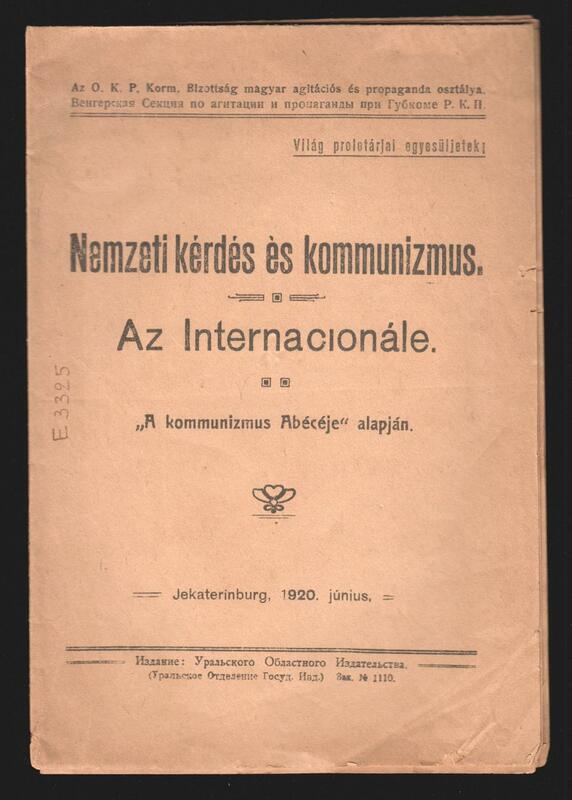 Ausgabe) - Dada global 193 (dort ebenfalls nur die 2. Auflage angegeben). Die Erstauflage der "Magnetischen Felder" erschien in einer Gesamtauflage von 180 nummerierten Exemplaren. 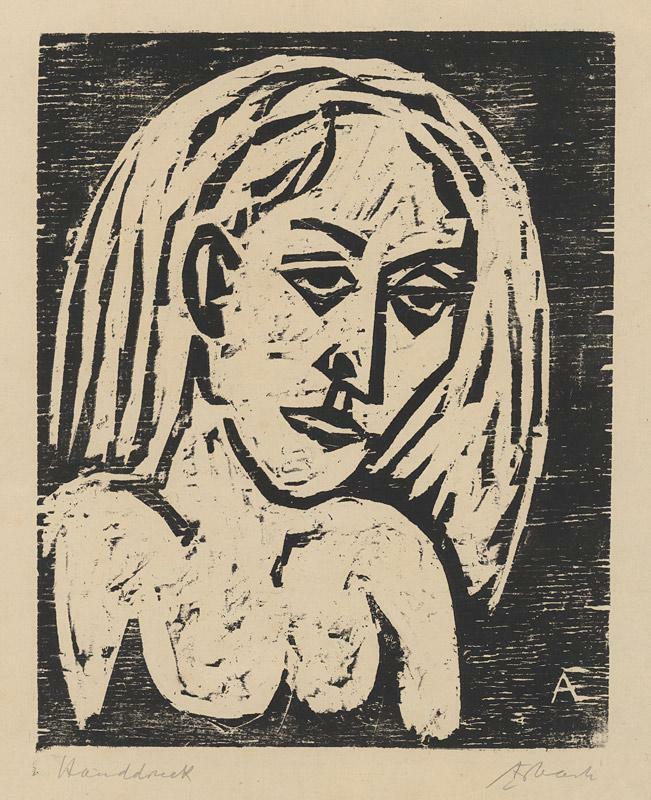 Vorliegend Exemplar Nummer 94 gedruckt auf Arche-Bütten mit den beiden gezeichneten Autorenporträts von Francis Picabia. Die Gemeinschaftsproduktion von Breton und Soupault stellt das erste Beispiel der "écriture automatique" der Surrealisten dar. Tadelloses, unbeschnittenes Exemplar. Zehn handkolorierte Lithographien zu Choderlos de Laclos Liaisons dangereuses. [Nummeriertes Exemplar].